PM, German Chancellor attend an innovation exhibit, and meet with Israeli and German businesspeople at the Israel Museum in Jerusalem. 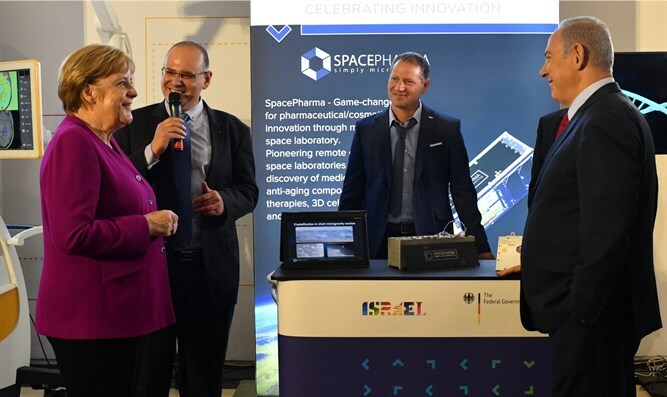 Prime Minister Benjamin Netanyahu and German Chancellor Angela Merkel, today (Thursday, 4 October 2018), at the Israel Museum in Jerusalem, toured an exhibit on innovation which included presentations by Israeli and German companies. Company representatives briefed the Prime Minister and the Chancellor on their various products. Prime Minister Binyamin Netanyahu and German Chancellor Merkel also held a roundtable meeting with Israeli and German business people. The sides discussed the potential for bilateral cooperation in innovation by creating joint platforms for the development of technologies in the fields of – inter alia – water, green energy and agriculture. The meeting was attended by Economy and Industry Minister Eli Cohen, German Federal Minister for Economic Affairs and Energy Peter Altmaier and Israeli and German businesspeople in the fields of – inter alia – agriculture, communications, cyber, automotive technology, medical instruments and pharmaceuticals. "This is a wonderful opportunity to have a meeting between Israeli and German innovators. The last meeting that Chancellor Merkel and I had we decided to have this roundtable and have this delegation meet with Israeli counterparts. I think, just from a few examples that we saw here, I think there are tremendous opportunities. Germany is one of the world's great economies. It has great science, great innovation, great industry and a wealth of experience. Israel is a leading innovation economy in the world today and the meeting ground of innovation I think is where the future, progress and value is made. I think the future belongs to those who innovate. Societies and economies that do not innovate will fall behind in providing the value and the justification for the prices they want to charge from their respected markets. The markets now are global and the ability to innovate gives a global competitive advantage. Each of us is doing it on our own fairly well, but I think we can do it far better together. I was struck, as I am sure Chancellor Merkel was, by the meeting ground between German and Israeli technologists. Starting from Merck, which has been here 50 years supporting the Weizmann Institute, using, making businesses out of things that were developed out of our academic environment and business environment, to the new exchanges between fresh entrepreneurs using the advantages of both countries. I think the possibilities are endless. I don't even think we can begin to estimate them. I was impressed by the fact that we had, for example, an air force pilot who went on to go into agriculture. And the German counterparts are coming with their own innovations, people who are coming from remarkable creativity and unexpected places. This is what I think can happen in the meeting ground between our two economies. Our men and women who have imagination and the discipline to pursue it, into practical products that save lives, improve health, improve agriculture, improve entertainment, improve anything. I think it's very exciting. I was very impressed; as I'm sure you were Angela. This is the future. It's right here. So I'm very happy to welcome you to the future which I think is the great possibilities of German-Israeli cooperation. It sets a new direction for the exceptional relationship and friendship between our countries. We have things that other countries would like to have. We can service mankind and womankind. And we can do it better together." CropX, Pixellot, Rapid Medical and SpacePharma R&D. Brainlab AG and Merck KgaA. EarlySense, Syqe Medical, Netafim, TAP, Infinity, Analog, XM cyber, Innoviz, AutoTalks, RAD and TEVA. Akvola Technologies, Atobcarry Holding, Brainlab, Deutsche Telecom, Hydrogenious Technologies, Ineratec, Merck, Obermeyer Holding, Samson and SAP.